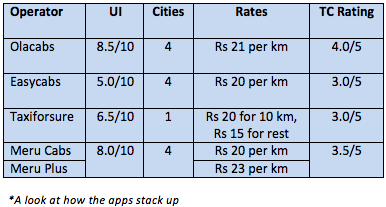 App Tracker: Which cab booking app will you opt for this monsoon? With monsoon just round the corner, it becomes that much harder to get hold of an auto when you need it the most. So what do you do when you are late for that important meeting or are about to miss out on a date? Well, most of you may think of booking a cab. But with so many of them, and most of them handy as well, which one should you choose? Which one has that slight edge over the others? To answer this question, in this week's App Tracker, we are reviewing the popular cab booking apps. Last week, we reviewed the popular SMS blocker apps, and for the same, we looked at a number of parameters such as the app's effectiveness in tackling spam, the user interface (UI) and ease of use. This time around, we are taking the reviews one step further and are introducing a table comparing key elements of the apps. Read on to know more. Once signed in, the app automatically finds out the user's current location on a map and provides details on the closest available cab, along with the estimated time the cab will take to reach him/her. Alternatively, users can also select their own pick-up location, choose to 'ride now' or schedule a pick-up for a later date. After a booking is done, a booking ID with details of the driver (name and contact number) and the car is provided to the user inside the app, as well as on SMS and mail. For tracking their cabs, users have to give a missed call on a particular number. We tried booking a cab in Delhi and the process was smooth. The car type we got was a sedan, and the rate charged to us for the journey was Rs 21 per km, along with Rs 2 per minute if/when we made the cab wait. Note that the minimum bill amount for a journey is Rs 100 and no payment has to be made at the time of booking; the amount is paid directly to the cabbie at the end of the journey. Users can also store cash in their accounts in the form of Ola Money, which can then be used for cashless journeys. There are two ways to get Ola Money—users can either recharge their accounts using credit or debit cards (this can only be done on the website) or by inviting friends to Olacabs (you get Rs 50 if they take a ride using the service). The accounts page provides details about the user, his/her remaining Ola Money, the rate card as well as details on upcoming and completed rides. 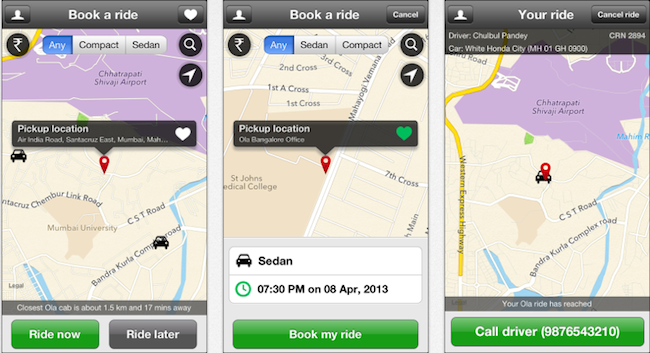 Users can also set frequent pick-up and drop-off locations as favourites for quick booking in the future. User reviews: According to Google Play, the app was downloaded between 10,000 and 50,000 times in the past 30 days. The average rating for the app is 4.2/5. TC rating: 4/5 (users should be able to recharge their accounts via the app as well). Unlike Olacabs, this app does not offer a map or automatically find out the user's current location. For booking a cab, users have to manually select the city, area, landmark and street/building for the pickup. Post that, they have to select a destination, a date and pick-up time. Interestingly, while the Olacabs app offers advance booking for journeys all year round, this one only offers it for the following day. We tried booking a cab a couple of times cab but were met with an error message that read 'Can't process at this time'. When the booking finally happened, we received a booking ID, with a message saying that the car number and driver details will be sent 20 minutes before the journey. Once booked, you can view the status of your booking and also cancel/modify the booking via the app. Additionally, for quick bookings, users can either mark booking as 'favourites' or repeat recent bookings. Similar to Olacabs, the payment is made to the driver once the journey is completed though there isn't any option like Ola Money for cashless journeys. The car type we got was a sedan, and the rate charged to us for the journey was Rs 20 per km, along with Rs 50 per 30 minutes if/when we made the cab wait. While the tariff details were not available in the app (which should have been), we called the customer care to understand whether there is a compulsory minimum charge for a journey (like Rs 100 for Olacabs), and a customer care executive told us there is no minimum charge. User reviews: According to Google Play, the app was downloaded between 10,000 and 50,000 times in the past 30 days. The average rating for the app is 3.4/5. TC rating: 3/5 (it's a decent app that can offer a lot more, starting with a map to facilitate bookings). 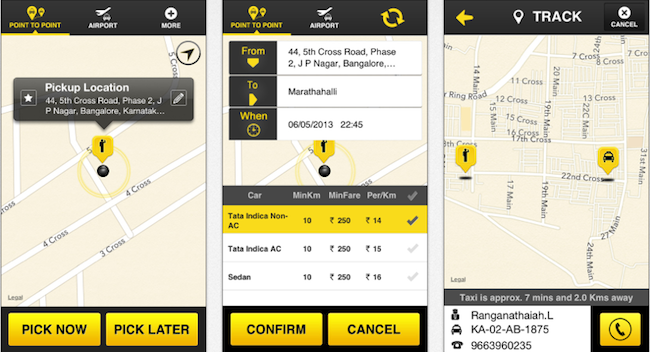 The taxi booking company Taxiforsure was founded in 2011 in Bangalore and it came to Delhi a few months ago. The app was launched a few days ago and currently it caters to the needs of customers in Bangalore only. The app starts with a detailed tutorial on how can it be used. Commuters can hire cab for point-to-point journeys or airport transfers and can choose pick-up points (if airport is the drop off point). There is also an option to choose between pick now—which means you need the cab within 60 minutes—and pick later—which means you need it later than that (how long that booking is valid is not specified). Users can track the cab via GPS and the driver's details are immediately available upon booking a cab. A price chart is also given on the drop-down menu in the top right tab on the screen. Users can also choose the car type as the option is given in the price chart. Booking history is saved and one can also mark some often-visited locations as favourites. Overall UI is pleasing but cluttered. It can take a while for a user to get used to it. Though it claims a taxi booking can be done in two taps that is certainly not the case. The first booking definitely takes some time and later bookings can possibly be done in two-three tabs (once the settings, favourites, etc. are saved). User reviews: As per Google Pay, the app was downloaded more than 500 times since its launch. Average rating given by users is 3.8/5. The app has just been launched in the Google Play store and has seen only single-digit downloads. The service is available in Mumbai, Delhi, Bangalore and Hyderabad. For using the app, one has to register with his/her mobile number and email ID. After registering, commuters are given two options—they can book 'for now' or 'later'. Now means within 35 minutes and later means more than 35 minutes and is valid unto three days. Users can also choose between Meru and Meru Plus, which are two offerings from the vendor. Users have to enter pick up as well as drop off points. Though it is capable of picking up the location using stored information, it works best with the GPS tracking on. Fare chart can be seen using the pull-up menu at the bottom of the screen. Using an ICE (in case of emergency) alert, which we found pretty interesting, a user can store unto two persons whom he/she 'trusts' or would like to inform in case of an emergency. Those two persons will receive an alert buzzer and an SMS about the user's location upon pressing the ICE icon at the top right corner of the screen. But for this feature to work, those two persons need to have the app installed on their phone as well. They can even track your location on the map for 30 minutes from the time the alert is sent. Other features like real-time cab tracking, saving favourite locations, details of booking history too are available in the app. UI is pretty good and clean. It is easy to get a hang of the app. This one is an simple-to-use, slick app that does its job well and in time. Additional features like ICE is a value add and going by the user reviews it does work (we didn't try it ourselves). The interface is very responsive; it doesn't lag anywhere. User reviews: Though the app has seen very few downloads, users have given it a thumbs up with five-star ratings (though only eight ratings are listed so far). TC rating: 3.5/5 (using the ICE feature, which is value-add, people should be able to contact others even when those who should be contacted have not downloaded the app in their phones). 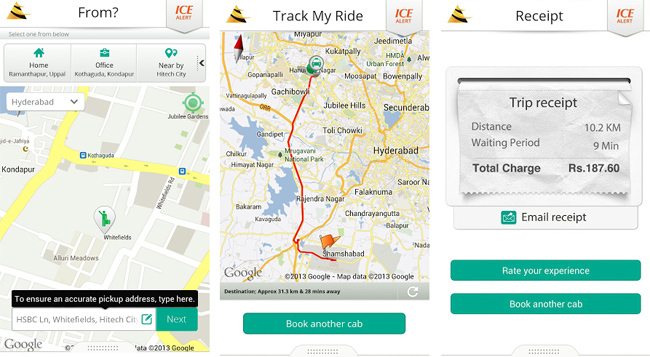 All these apps will come in handy for frequent users of cab services though Merucabs' ICE feature stands out. With the growing concern over commuters' safety, all apps should have such as alert feature. Hope this week's App Tracker will help you make an informed decision the next time you call a cab. We will be back with the next edition of App Tracker in a week. Note that you can write to us if you want a category or an app reviewed.